Fall is my favorite season….I love the crisp leaves underfoot, the arrival of those warming hearty comfort foods, and anticipating the tastes of holidays to come in a sumptuous array of spiced, pumpkin-y goodies that show up this time of year. I mean, pumpkin is one of those feel good indulgences we dietitians love to crow about-rich in beta carotene, vitamin A and fiber…with canned pumpkin boasting a shelf life that works for even the most laid back plans to get around to using it. But here's the catch: if you look closely, you'll discover, to your immense disappointment (and if you're like me, perhaps some slight irritation), that many of the feted "pumpkin" holiday treats actually contain little, if any, actual real pumpkin. To make matters worse, a close look at some of the most popular and prevalent (for instance, those pumpkin spiced lattes or baked breakfast goods) reveals that they can be actually shockingly high in all sorts of added sugars, trans fats, artificial colors, flavors, or other scary ingredients. So before you before you eat it, sip it, or swirl it into your breakfast this fall in the name of healthy holiday indulgences, be a stickler for the details, read the label, and insist on high quality ingredients that sound like they came from your kitchen. Or you can simply make it yourself. 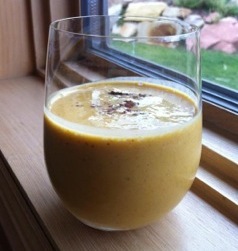 Here is one of our favorite fall desserts to make at our house…it’s like pumpkin pie in a glass! We serve it for dessert, because…well, who are we kidding? It's sweetness feels like it deserves to be called a dessert. This version is vegan, and I prefer to use Farmer's Market Organic Pumpkin from the tetra pack-no BPA concerns that you can have with canned pumpkin. Place all ingredients in a blender and blend until combined. Pour equally into 2 glasses.